14 Şubat 2019 Perşembe 14:00 - 6 reads. For the sixth week in a row today klimaatjongeren on the street. This time, the mars again down in Brussels. In addition to students, especially students expected. The proof is around 11 hours left to Finish. On the Koning Albert II-laan, the starting point for the sixth mars of “truancy for the climate”, was around 10.45 pm already many people present. 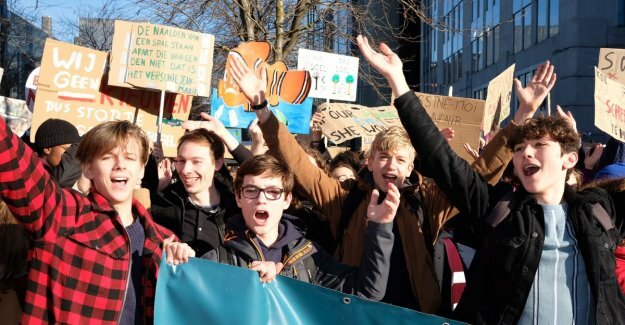 The enthusiasm remains high at the klimaatjongeren. Waves of cheers go through the crowd and everyone is still “plus chaud que le climat”. Along the side there are a lot of adults still to take a picture of the klimaatspijbelaars and to encourage them with clear messages like “keep full”. “It is of the pot given that our protest has been hijacked by the radical left. It is normal that there are many left-wing people, because they give to the environment. But this is the most comprehensive subject ever so it doesn't matter whether you are right, liberal or conservative are,” says The Weaver. “Yesterday I had a conversation with the new prime minister of the Flemish Koen Van den Heuvel and I was very pleased about. I saw in him the same frustration as me and he understands that the situation is urgent,” said The Weaver.